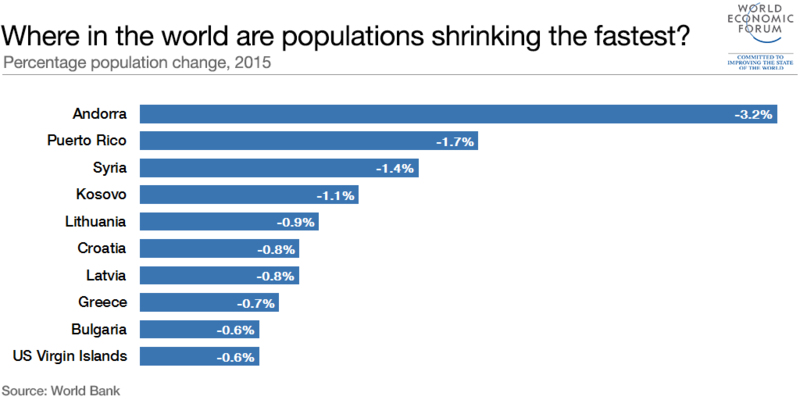 Where in the world are populations shrinking the fastest? In 2015, Andorra's total population shrank by 3.2% to 70,473. Wedged between France and Spain, tiny Andorra is the 16th smallest country by land and the 11th smallest by population. And it’s becoming even smaller. In less than a decade, Andorra’s population has fallen by nearly a fifth, and the European principality is now home to the world’s fastest-shrinking population. Andorra’s total population fell by 15,000 to 70,473 in 2015 from its peak in 2009, based on data from the World Bank which pooled information from regional and global organizations and national censuses. In 2015 alone – the latest year on record – it shrank 3.2%. Globally population growth stands at around 75 million, or 1% a year, and while much has been written about the challenges this creates, some countries are grappling with an entirely different problem – decreasing populations. This leads to skills shortages and less money for facitilies and services. In 2015, there were 25 countries where more people died or emigrated than were born or entered the country. In the case of Andorra, a wealthy country with one of the longest life expectancies in the world, there are several factors behind the steep population decline. One is the number of babies born. Andorra is ranked 223rd in the world for annual birth rates, with only 7.8 babies born per 1000 inhabitants. By comparison, Andorra’s neighbours France and Spain, with 12.3 and 9.4 births per 1000 inhabitants respectively, are placed 161st and 205th. In addition, the Andorran government is highly selective about the number of new residents it allows in because of the principality’s high ratio of foreigners to nationals and its status as a tax haven. And of course, in such a small country minor fluctuations in population make a large percentage difference. The ongoing conflict in Syria provides an obvious reason for its recent rapid decline in population – one of the fastest worldwide. In 2006 the Syrian population was climbing 3.2%; by 2015 it was shrinking by 1.4%. Syrian refugees have spread across the Middle East region, with the populations of host countries such as Turkey, Lebanon and Jordan swelling as a result. Some Eastern European nations and former Soviet states including Kosovo, Lithuania, Croatia, Latvia, Bulgaria, Serbia and Romania are also among the countries with the fastest shrinking populations. For years, low birth rates and economic emigration has reduced their populations. A decade ago they also featured in the list of countries with the fastest-shrinking populations. By contrast, Oman, the country with the fastest-growing population in 2015, increased almost 6% in just one year.